Can you believe this one?!? I was walking down the street in Chisinau, minding my own business when suddenly this Canadian flag leapt into my awareness! It seems that Canada, specifically Quebec, is doing a big push for Moldovans to emigrate to la Belle Province. So many Moldovans are constantly leaving anyway, somehow Quebec has clued in to the fact that they could learn French and help populate that part of Canada. So here I am on the other side of the world and suddenly my country (not the other North American country!) is becoming well-known in the eyes of my hosts. I only recently realized what a rare bird a Canadian is in this land. While contacting the (closest) Canadian embassy in Bucharest I asked the nice lady how many Canadians are in Moldova. She told me that the embassy is only aware of 5, and the other 4 are Moldovan-born who lived in Canada for some time and obtained citizenship. 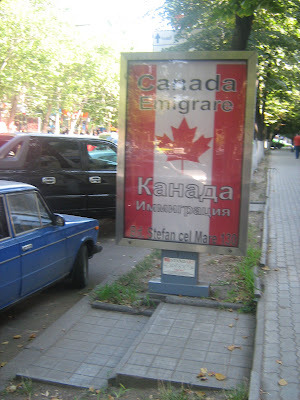 In other words, to the best of my knowledge, I am the only Canadian-born Canadian living in Moldova! And I barely even remember any French! C'est la vie! Posted by Barb at 5:32 p.m.